Amidst a massive pile of review materials and the upcoming mid-semester exam next week, I bravely left my study desk and headed to Innes National Park for a day trip with my friends last Sunday. After enjoying the invigorating alta vista at Stenhouse Bay Lookout, our next stop was Cape Spencer. The weather never cooperated creating a dull reflection of the overcast sky on the historic Investigator Strait. Facing south, I still tried to capture the best photograph I could take of the lighthouse across... and moved my eyes right and left, up and down so I could spot a remarkable scene around. From the edge of the cliff where I was standing, I noticed a couple down the great platform of rocks- which I believe a granite. 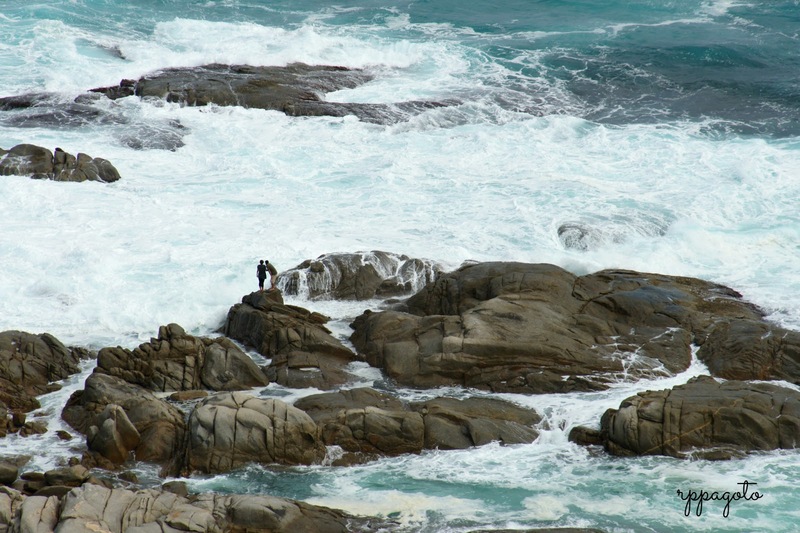 The strong, chilly wind and the rough surf down there didn't deter them from whatever intentions they wanted to pursue. They've honestly inspired me to stay on track as I work towards the fulfilment of my dreams and, like these sturdy rocks that have stood the tests of time, to face the enormous challenges in the university this year. 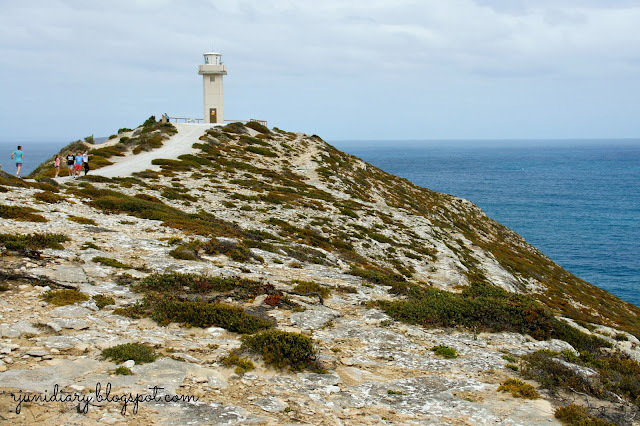 Cape Spencer, Innes National Park, Yorke Peninsula, South Australia. The Cape Spencer Lighthouse that I was referring to... The couple on the platform of granite rocks featured on the photograph above was seen below the right side of this slope. Breathtaking view! But wait, was the couple still safe? The waves and rocks looked dangerous! When we left the place, the couple was still there. I hope they had found they way home safely (well, I didn't hear anything from the news). Beautiful photos esp that first image. Hindi po ito DSLR, Sony NEX-5 lang. Sorry for the late reply, busy po ako sa university.